2.2.1 During safety braking, coordinate with the safety valves in hydraulic station to realize primary and secondary braking, and the VFD enters into feedback braking state. Stroke control is conducted by the PLC system, which mainly divides the lifting process of the hoist into various intervals in accordance with different lifting speeds. Convert the given value of the VFD speed in accordance with the actual situation and different speed requirements of each interval, and form into closed loop to smoothly regulate the lifting speed of the hoist. The stroke control not only controls the speed of the whole lifting process of the hoist, but also the stop and braking process. The stroke control can prevent various accidents of the hoist such as over winding, over discharging, derailment and overturning from happening. It especially applies to special inclined shaft with curves and turnoffs. The regular braking of the hoister includes feedback braking, contracting braking, etc. Feedback braking is realized by introducing an inverter link into the DC link of the AC-DC-AC voltage type VFD. 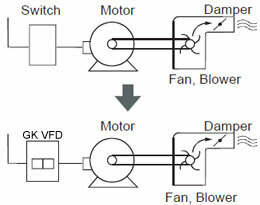 When the actual operation speed of the crane/hoist is higher than the given operating speed, the ac motor equals a generator, the voltage of the DC link increases, which provides energy to the VFD and feeds back to the power system, and the ac motor automatically operates in a braking state to realize accurate stop of the VFD and also to well prevent mechanic shock and fast slide. Contracting braking is usually used during stops when it moves to the stop position, the process controller sends a stop signal to the VFD, and in the meantime, it also sends contracting control signal to the contracting brake to realize contracting braking. When there is an accident such as derailment, the operation control conducts emergency contracting braking. The VFD receives speed feedback signal from the rotary encoder, forms PG vector control, and realizes stepless speed regulation of the ac motor. This system is consisted of VFD and energy feedback unit. (7) The VFD has over-voltage, under-voltage, over-current, overload, components overheating and lack-phase protection for the ac motor, has failure memory function which can save the latest 5 failed functional codes and the last failed parameter. (1) All-digital speed sensor closed-loop vector control to provide a wide range and high precision for the system speed regulation. When the VFD operates under low frequency and can ensure more than 150 % of rated torque. The maximum torque is twice to the rated torque. The basic principle to realize vector control is to first measure and control the stator current vector of the asynchronous motor and then control the exciting current and torque current of the asynchronous motor in accordance with the field orientation theory, in this way realizing the purpose of controlling the torque of the asynchronous motor. The specific procedure is to divide the stator current vector of asynchronous motor into the current component (exciting current) which can generate a magnetic field and the current component (torque current) which can generate torque, and in the meantime, control the amplitude and phase of these two components, i.e., control the stator current vector, and this control mode is called vector control mode. In this way, a three-phase asynchronous motor can be controlled like a DC motor, and static and dynamic performances same as a DC speed regulation system can be obtained. The main purpose is to increase the braking capacity of the VFD, and feedback the braking energy to the power system when the winch puts down heavy weights for energy conservation. Considering both the mine environment and the transportation condition, choose the I60k VA VFD.